We moved to Hawkwell in 1944 when my father took a job with A.M.& H Rankin of Stambridge Mills (later to become part of Imperial Foods, I think). As part of his deal, we had the opportunity to live at Gusted Hall and we did so until the mid/late sixties when this photo was taken. The car is an Austin A40. While we lived there, I did a lot of research into the history of this fine old house and I traced it back to 1199, when it was then known as Gratsted Hall. Later it was known as Grethstud, Grestestede, Gristed, Gusterds and finally Gusted Hall. The name is supposed to mean 'gravel place' athough we never could understand why. I am told that it was also known as Cristed and Cristell. Early in the 15th century it was owned by the Earl of Ormond, of the Manor of Rochford. I believe the house was also once owned by Thomas Bullen, father of Ann Boleyn. The house changed hands many times in the next 3/400 years and in 1881 was bought by an ironmonger of Lewisham. Then Gusted Hall, with 135 acres of farmland, was described as "An agricultural and sporting property with gardens, orchard and choice shrubs, plants and park like undulating pastures". I actually lived there for 20 years until I got married in St Mary's Church, Hawkwell. Along with my 2 brothers, Tim and David, and also Mary our sister, we had great fun, especially in the summer when we would help the farmer get in the hay or the corn. The farm boasted prize bulls at that time as well as herds of cattle. The main barn housed numerous barn owls and in the woods next door was a huge badgers sett, which drew photographers from various magazines and local newspapers on a regular basis. In the winter, Gusted Hall was a very cold place to be and in 1947 the house was completely cut off by 30ft snowdrifts pressed up right against the house....thank goodness for the local tractor driver, 'Honk', who eventually dug us out. In 1953, we finally got the Electricity Board to install electricity after living many years with just a generator. This page was added by Helen Barnard on 05/12/2011. My great nan lived in Gusted Hall with her mother in the early 1900's. Her mum was the house keeper. I know nothing of the father. One night her mum became poorly and my great nan ran to Rochford to get the doctor. Unfortunately she died that night leaving my great nan on her own. Her name was Laura. The people of the hall looked after her and actually gave her a small house in North Street Leigh. Being resourceful during the First World War she took on lodgers! She had a plan though and saw that an elderly man living in West Street had a large house with 3 big bedrooms, so she asked if he would swap! He did and she lived there until she was 97, passing away in Rochford Hospital peacefully after a short illness. Hello, can anyone enlighten me on the history of a brass plaque on an old oak tree? It mentions Molly who it seems was very ill & passed away. Dear Bob. Many thanks for your assistance. Also to Brian Petitt for the additional details and email address. I will give it a try and see if Andrew is still about. Just for your information the details I have of Peter Kyd is that his date of birth was 18th June 1913 and in 1946 he was listed as being a Traveller & Salesman for A. M. & H. Rankin Ltd, Stambridge Mills, Rochford, Essex. At the outbreak of World War II he was 26 and an RAF Pilot. In February 1940 he trained in America and in 1942 he joined 172 Squadron, Coastal Command, and was engaged in Anti-Shipping and Anti-Sub Work. He was demobilised in January 1946. I also have details of Peter's father, James Kyd, who was 55 at the outbreak of WWII and was a Sub-Lieutenant in the 7th Essex pre-War and mobilised in August 1939. He served until May 1942 and was demobilised having reached the age limit. He then joined the City Fire Guard serving until the end of the War. As previously explained I am still researching a lot of information I have and if I find anything of further interest I will let you know. Ian - I used to work with Andrew Kyd at Midland Bank and contacted him for the article. Peter Kyd was his father and Andrew sent me a photo which I will forward via Bob our webmaster. Both Peter and his brother Ken played cricket for Rankins CC and I believe Peter worked on the milling side hence he lived in the Rankin family-owned Gusted Hall for a time. I will dig out an email address and also send via Bob. Can anyone tell me if Andrew Kyd's father was Peter Kyd who lived at Gusted Hall in 1946 and worked for A M and H Rankin Ltd. Is there any way we could contact one another? I am 68yrs old. My Mum, born in 1915, Doris E. Fry (with her sister Ivy) grew up in Honeypots, a smallholding in Gusted Hall Lane. Her adoptive parents were Tom and Edith Robinson. Edith died whilst Mum was in her teens and Tom then married Daisy. The smallholding was stocked with goats, pigs and poultry, supplying villagers. Mum's lifelong friends were Jo and Edna May whose parents ran a nursery garden in the village of Hawkwell. A dear friend and neighbour was Mrs Rawlings. Grandpa Robinson apparently worked at Gusted Hall. He drove a bull-nosed Morris Cowley, Mum and Ivy rode in the dicky seat in the back. As children we only visited once from Cornwall (Mum had married Fred Lang from Penryn in Cornwall, a soldier with the DCLI) and I have memories of giant ant hills on the edge of the woods, and a pond with moorhens. It was possible to see across the countryside for miles, unlike Cornwall which is all hills and valleys. Does anyone have memories of Doris Fry/Robinson and Honeypots? ... Joy Thomas would be interested to hear! Sheryl Sutherland posted the following request on the General Message board on 28/04/2013. As not many people look there I've reposted it here. "Hello, Can anyone tell me when the Peck family moved out of Gusted Hall? I have census records up to 1911, with Charles still living there. I live in Australia, so any help would be appreciated with history on this beautiful home. 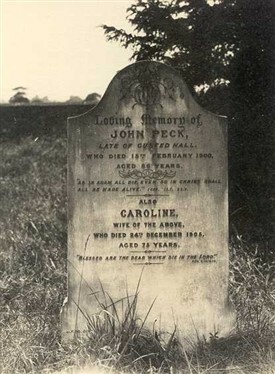 My Great uncle John Peck died in 1900 & I am also trying to located his burial site. Many thanks." To Ronnie Pigram & Rachel Hill, many thanks for your comments. Ronnie, I will see if I can locate a funeral director in that area & ask the question. If I manage to get the burial site I would be so happy if you could photograph it for me. Rachel, where do you fit into the family? My G-grandfather & John Peck were brothers. In reply to Sheryl Sutherland. It's a long shot but worth a try as I did similar many years ago when I wanted to find the grave site of my grandfather who died in 1965. I contacted all the funeral directors in the area, giving them the name and date of death. One still had the records and provided the information I needed. If you do find the information I'll be pleased to visit the location and take some photographs for you. Good luck with your search. In reply to Sheryl Sutherland, I'm also a descendant. I am a descendent of one of the owners of Gusted Hall, John Peck; 1814-1900. I was wondering if anyone call help me locate his gravesite? I have a photo of the headstone, but do not know it's location. I live in Australia, so getting around to looking for the site is a near impossibility! Any help would be appreciated. I remember you too Pam, and Eric. I was also a member of Tudor Queen Productions and have many memories. Andrew Kyd is my brother-in-law! 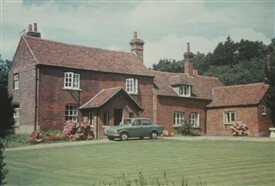 Gusted Hall is where I met my husband Terry. Pam, would you be able to let us have more information about the Tudor Queen Productions amateur drama group, if it was in the Rochford District or had other members from the District? I knew your sister Mary, when she was a member of Tudor Queen Productions, an amateur drama group, which was run by my husband, Eric.